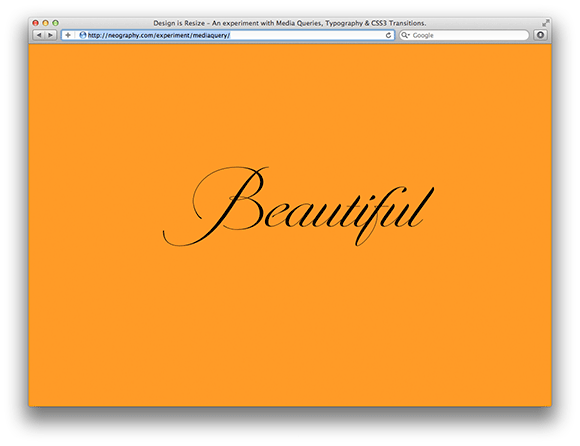 A fun little experiment with Media Queries, Typography & CSS3 Transitions. Inspired by Arley McBlain‘s site and his clever use of CSS Media Queries, I set out to explore the posibilites using this technique. 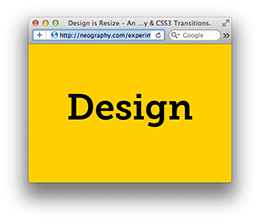 In my first try I wanted to use simple CSS transitions to create a compelling piece. The result is a good one, but the possibilites of what can be done are endless. Go on… Click & resize your window. Typekit is used for all the different typefaces, a bit of CSS3 Transforms, background transitions and bam. Done. Pretty basic, when the browser window reaches a certain size, in this case 580px it hides one word, displays the next one and it applies font-size changes, background changes and rotations. 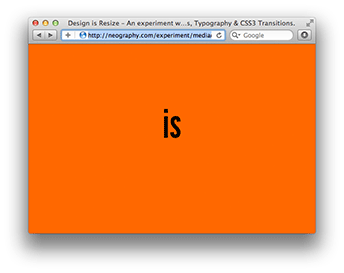 This experiment works best when viewed in Safari, but it should work just fine in other browsers. So there it is, a simple experiment, but I’m excited at the possibilites.